Quick buttermilk corn bread is moist, soft corn bread. Made with brown sugar and white sugar giving it a rich flavor. This is definitely a corn bread that you can top off with some honey, butter, or even eat it by itself. That is what most of my family enjoys doing. Quick buttermilk corn bread is also a great corn bread for the holidays coming up in the next couple of weeks. It is so weird to be writing about the holidays. It seems like I just put the Christmas tree away a couple of months ago. I am always looking for a quick and easy recipe, recipes for that wonderful Thanksgiving dinner and the times when you are just trying to figure out something good to feed your family. Quick buttermilk corn bread is great with chicken taco soup or any chili, you can even make quick buttermilk corn bread for Thanksgiving. I am so excited for Thanksgiving this year, it will be great to have the family all together again. I am pretty sure that there will be a turkey bowl in the morning. What is a turkey bowl you ask? A turkey bowl is when the guys go and play football. Now remember, I live where it is cold and a lot of the mornings, there is snow on the ground. This doesn’t seem to faze the guys. If you ask me, I would rather stay home and cook in a nice warm kitchen. However, I do want to have some of my cooking done the day before so that I can spend time with family. Visiting or playing some fun games. Come to think about it, I had better get my assignments out because Thanksgiving is less than two weeks away. Some of the things that I have never had for Thanksgiving are green bean casserole. My daughter has this as a tradition and so I will ask her to make one. One other thing that is a must around our house is sweet potato souffle, we love it!! It almost tastes like a dessert. Now I am all over sweet potatoes when they taste like dessert. I think that you will need to try Quick buttermilk corn bread, then let me know what you think about it. 1- The original recipe called for canola oil, but I thought the coconut oil gave the quick buttermilk corn bread great flavor. 2- The original recipe called for 2/3 cup brown sugar and 1/3 cup white sugar, but this was plenty sweet. 3- If your batter is too thick, add 3 Tablespoons of regular milk. 4- Let it cool in the pan for about 10 – 15 minutes; otherwise it crumbles. In a large mixing bowl, combine the cornmeal, flour, sugars, baking soda and salt. Then add the egg, buttermilk, oil, and apple sauce. Pour into a greased 9" square or round pan. Bake in a preheated oven at 375 degrees for 30 - 35 minutes or until the center comes out clean when tested with a cake tester. Cool for 5 - 10 minutes. 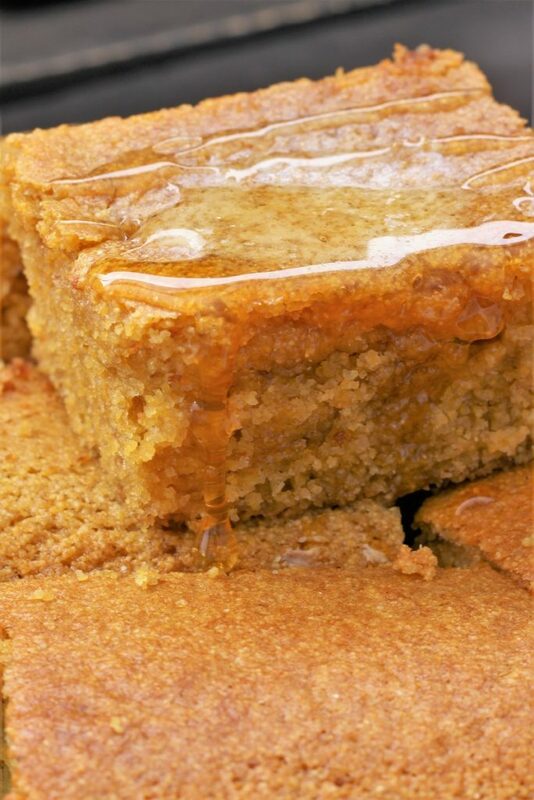 Adding brown sugar to a corn bread is a good idea. Will try that when I make corn bread next. I too miss my cooking when we’ve eaten out for several days or are away from home. Yep, nothing like home cooking!!! Enjoy the cornbread. I love cornbread!!! It’s my favorite! And the turkey bowl sounds too cold for me too heheheh. I hope you have a great Thanksgiving with your family! This cornbread turned out so well. It really is delicious. And yep, no turkey bowl for me!!! 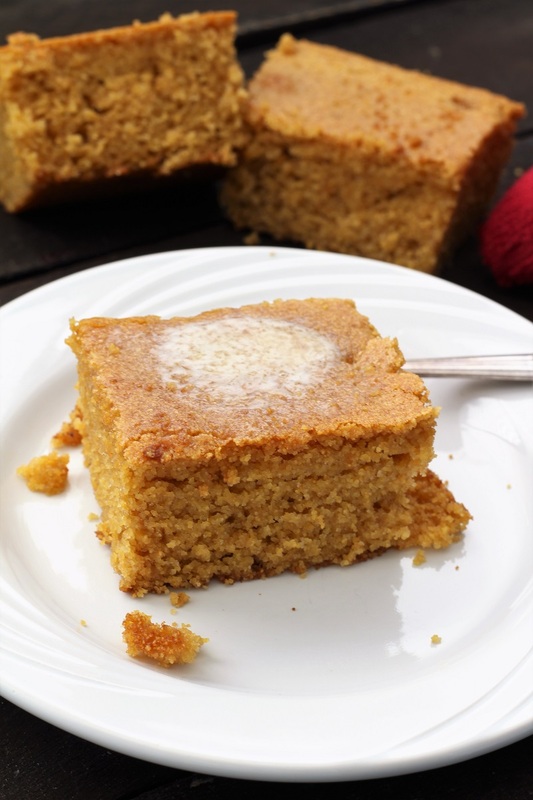 I love the idea of adding brown sugar to cornbread! It looks so yummy! 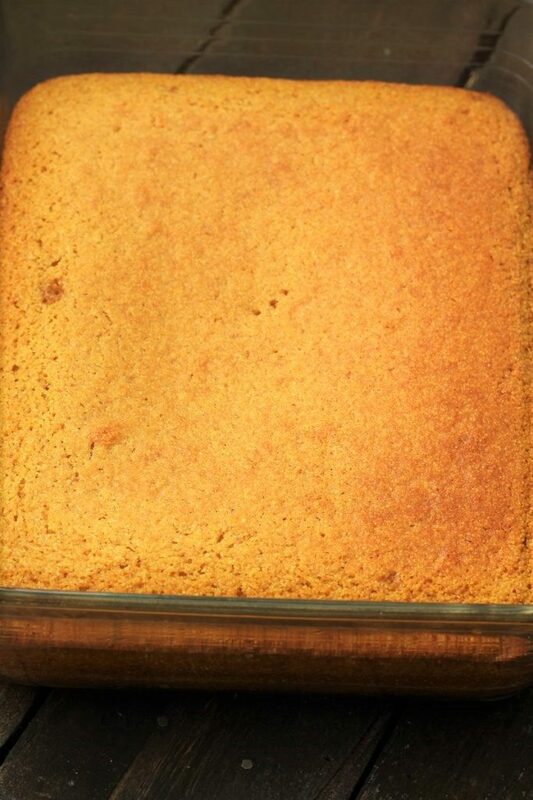 The brown sugar is really good in the cornbread. Thank you for coming by and commenting.